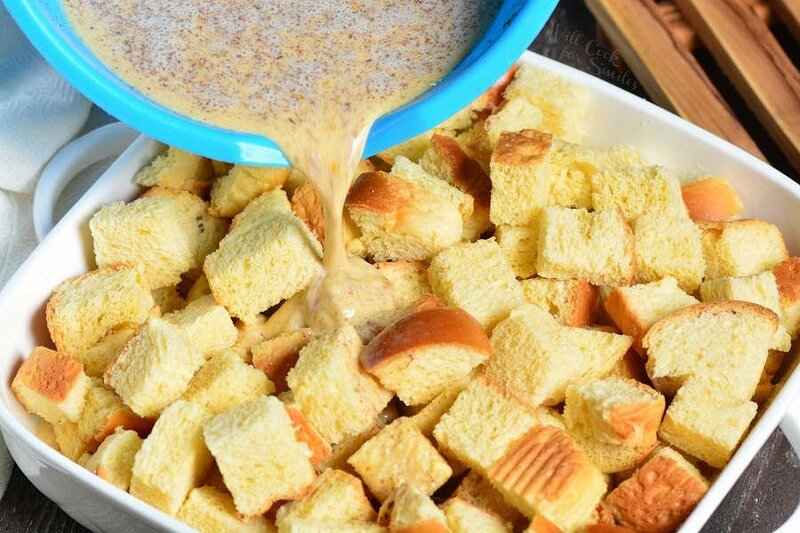 French Toast Casserole makes the best holiday brunch. This breakfast casserole is so comforting and made with simple ingredients. 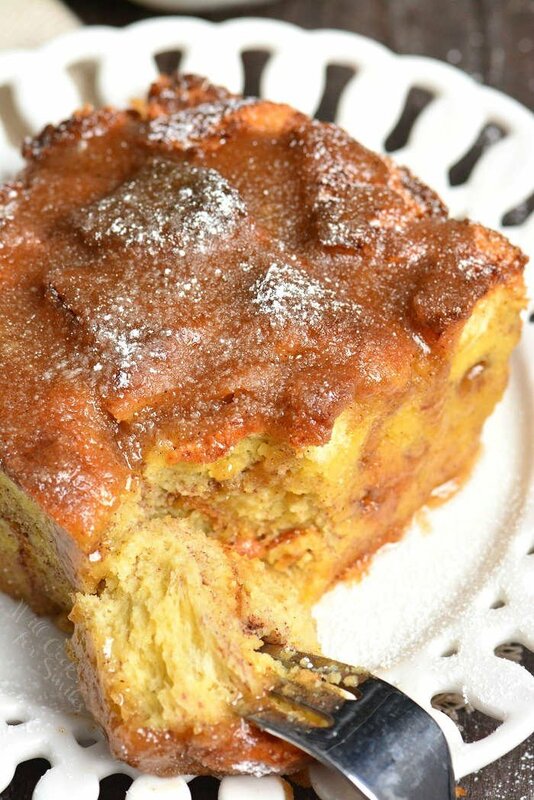 Brioche bread is a great choice for the French Toast Casserole because it’s soft and fluffy and soaks up the sweet egg mixture perfectly. 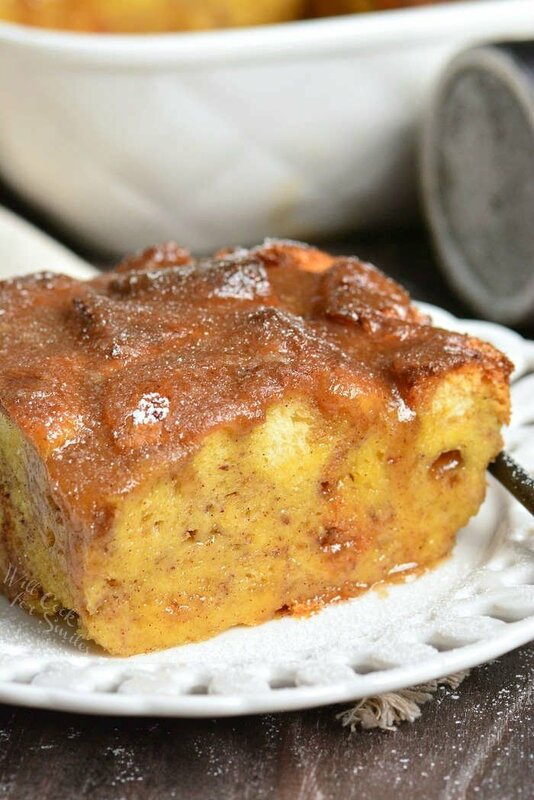 This casserole is flavored with cinnamon throughout and topped with an easy sweet butter syrup. Classic French Toast is one of my favorite weekly breakfast recipes and turning it into a weekend brunch seems like the best idea. That is a good question. Since I couldn’t think of an actual difference in base ingredients or cooking method, I did a little research. What I found was nothing. Nothing is different between the two dishes. Both dishes feature pieces of stale bread soaked in sweet egg and milk/cream mixture and baked in a casserole dish. 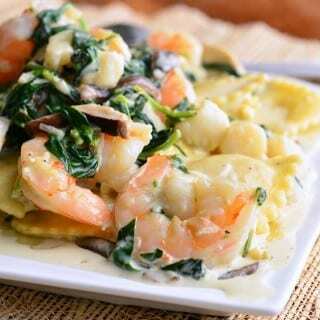 You can add different flavors or use different kinds of bread, but the main idea is simple and comforting. 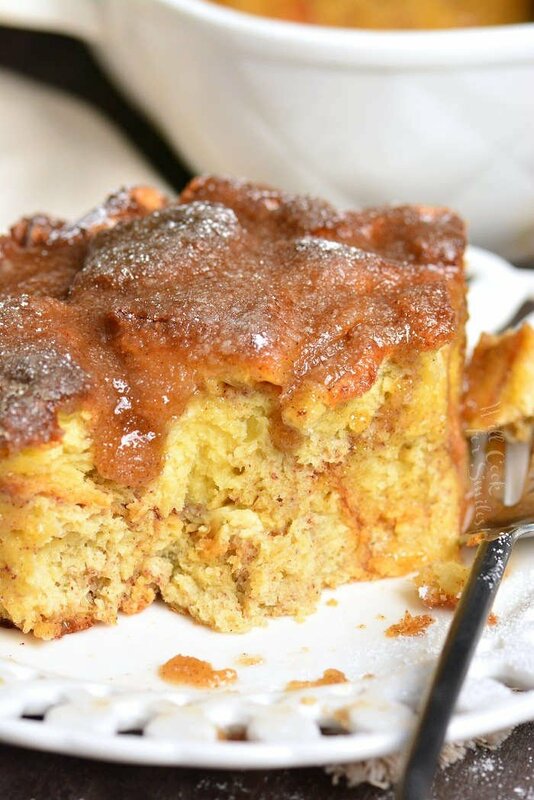 So what does make bread pudding and French toast casserole different? I’m thinking the ability to have it for breakfast. 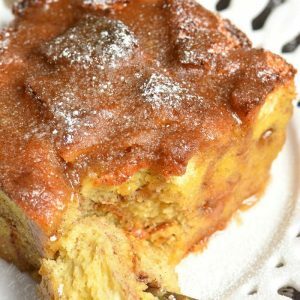 If you call it “French Toast Casserole” to your guests, you can serve it for breakfast and brunch with a mimosa. 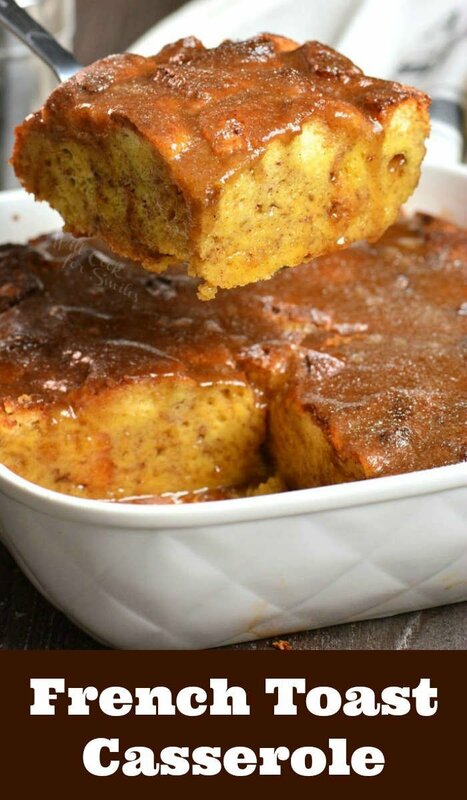 This particular French Toast Casserole recipe is actually perfect for breakfast because it’s made with Brioche bread. Using Brioche makes this casserole softer and much less dense than when using a French baguette. Brioche also soaks up the egg mixture much better. So it does taste and feel more like a breakfast dish than a dessert. 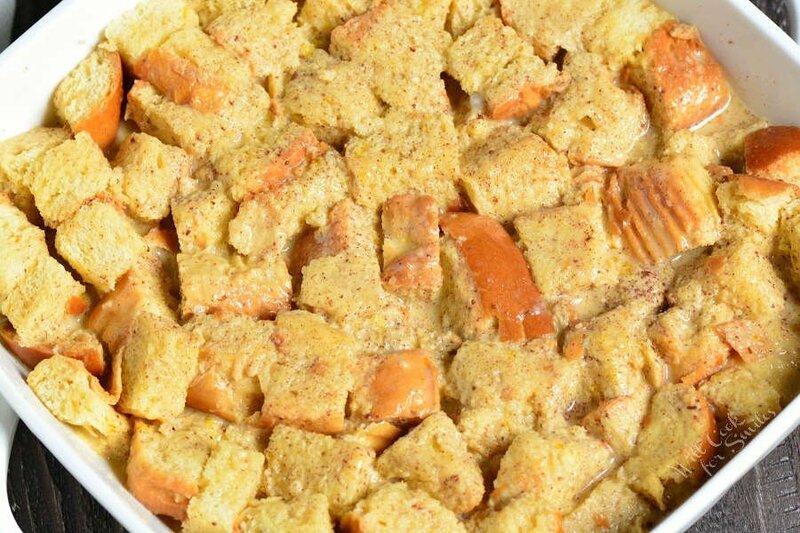 The longest part about preparing French Toast Casseroles and Bread Puddings is getting the bread stale. One way is to let it get stale on it’s own, over a period of a day or two. Cut bread into small, 1-inch cubes and spread the pieces evenly in a large rimmed baking sheet and just let them dry for about 24 hours. Preheat oven to 200°. Cut the bread the same way as you would be making is ahead of time. Spread bread cubes on a large rimmed baking sheet and place it into the oven. Let them harden for about 2 hours. NOTE: For French Toast Casserole and Bread Puddings, I only bake it for 45 minutes – 1 hour, that way it’s not completely dry. 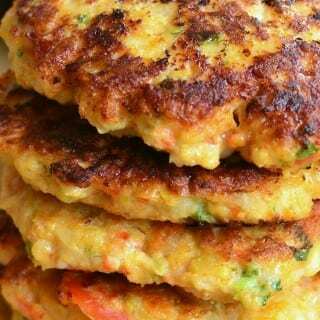 Take them out and you can prepare the casserole. Prepare stale bread ahead of time, whether it’s the slow method or the fast method. Preheat the oven to 350° and grease a casserole dish. 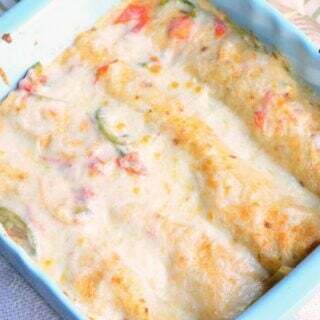 You can use a 9×13 casserole dish or a deep 9×9 casserole dish. In a large bowl, whisk together eggs, milk, heavy whipping cream, vanilla extract, sugar, and cinnamon. Whisk until all smooth and combined evenly. Pour egg mixture over the Brioche bread cubes evenly, all over. Press down all over the bread so that it all gets soaked. 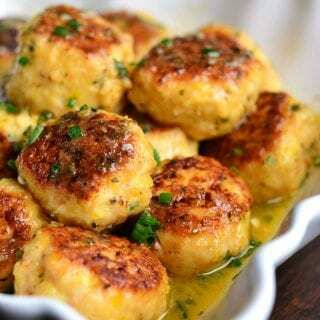 Bake for 45-50 minutes in a 9×13 casserole dish or 50-55 in a 9×9 casserole dish. TIP: If the top is browning too fast, you can cover the top loosely with a sheet of aluminum foil when it starts to brown. Once it’s baked, pour prepared syrup all over the top and give it a few minutes to soak through. 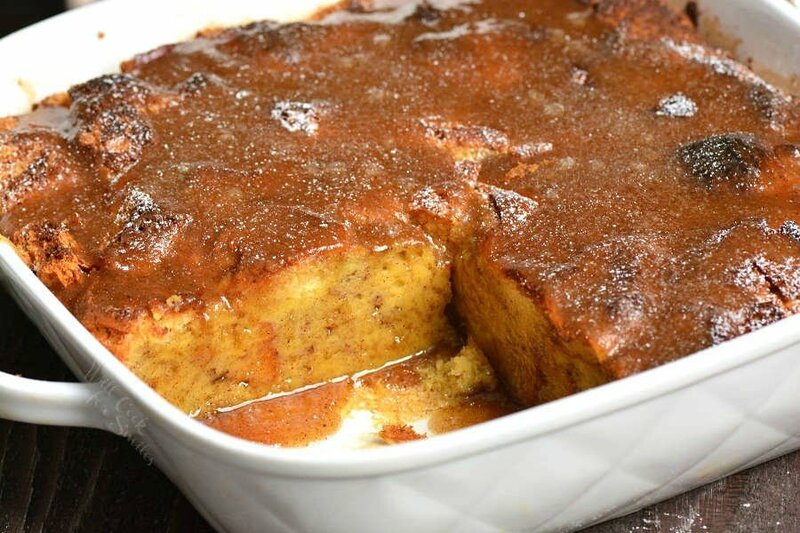 French toast casserole can be easily reheated in individual pieces, in the microwave. 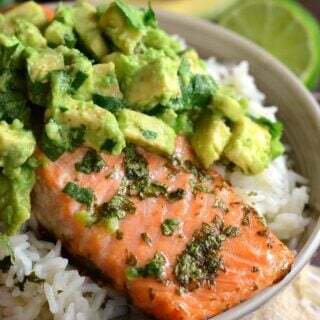 Simply place a piece on the plate and cover with a microwave safe top. Reheat for about a minute, depending on the size of the piece. If you want to re-heat a large amount, you can do it in the original casserole dish, in the oven. Preheat oven to 325° and cover the casserole dish with a sheet of aluminum foil, relatively loosely. Bake for about 30 minutes, or until warm inside. 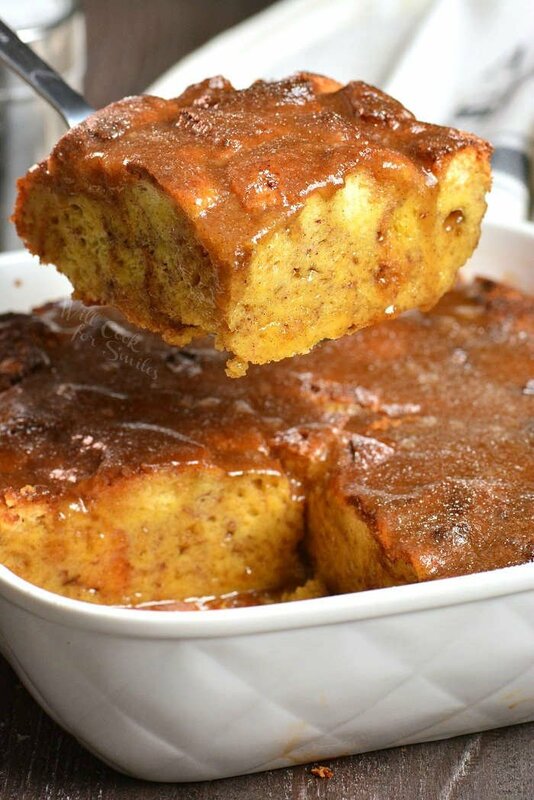 French Toast Casserole makes the best holiday brunch. This breakfast casserole is so comforting and made with simple ingredients. Cut bread into small, 1-inch cubes and spread the pieces evenly in a large baking sheet and just let them dry for about 24 hours. For French Toast Casserole and Bread Puddings, bake it for 45 minutes – 1 hour, that way it’s not completely dry. 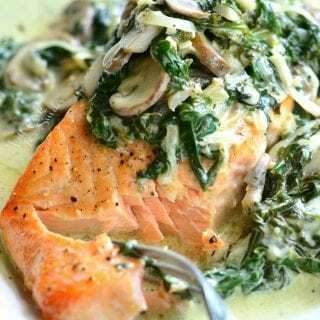 Bake for 45-50 minutes in a 9×13 casserole dish, or 50-55 in a 9×9 casserole dish. TIP: If the top is browning too fast, you can cover the top loosely with a sheet of aluminum foil when it starts to brown. Melt butter in a small sauce pot over medium heat. Add powdered sugar, heavy whipping cream, cinnamon, and nutmeg and stir until combined. Bring to simmer and simmer for a couple of minutes but keep an eye on it. Take off heat and stir in vanilla extract. A good evening refreshment. I’ll serve it with tea so that the kids dip it in and drink/eat. GOod read!